Heat up the pan, add oil, then Brenpa’s Mindful Sauce. Add green peas and stir until the peas are done. 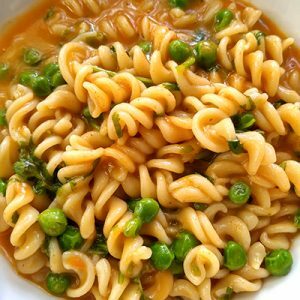 Don’t strain the pasta water, add the cooked pasta noodle with water to the green peas saute mix. Add spinach and salt to taste. Let is sit for 5 minutes and enjoy ! Did you notice your breath while making this dish? Did you get to spend a moment practicing gratitude for this moment? Research shows the happiest people practice constant gratitude..and that is how they attract more goodness towards them. Thank you for being part of our journey. It’s our joy to share our gift with you. breathe, brenpa's kitchen, conscious consumer, Mindful Chili Sauce, pasta, Soup, spicy. mindfulness, vegetarian. Bookmark.